From Why Truth Matters (Continuum: 2006) by Ophelia Benson and Jeremy Stangroom, Chapter 1, ‘The Antinomies of Truth’, pp. 18-21. But does it really matter? Is it worth bothering about? Academic fashions come and go. Dons and professors are always coming up with some New Big Thing, and then getting old and doddering off to the great library in the sky, while new dons and professors hatch new big things, some more and some less silly than others. Casaubon had his key to all mythologies, Derrida had his, someone will have a new one tomorrow; what of it. Yes, is our answer; it does matter. It matters for various pragmatic, instrumental reasons. Meera Nanda discusses in Prophets Facing Backward the way Hindu fundamentalists in India have drawn on postmodernist scepticism and hostility to science in “Hinduising” Indian science, education, textbooks and the like. Richard Evans argues in his book In Defense of History that postmodernist scepticism about historical evidence and truth, along with valuable insights, also has dangerous implications. That passage is in a book published in 1997. Three years later Evans saw his point enacted in a court of law. In the David Irving libel trial held two years ago, in which I served as an expert witness for the High Court in London , Irving was suing Penguin Books and their author Deborah Lipstadt for calling him a Holocaust denier and a falsifier of history. It was not difficult to show that Irving had claimed on many occasions that no Jews were killed in gas chambers at the Auschwitz concentration camp. He argued in the courtroom, however, that his claim was supported by the historical evidence. The defence therefore brought forward the world’s leading expert on Auschwitz , Robert Jan Van Pelt, to present the evidence that showed that hundreds of thousands of Jews were in fact killed in this way. Van Pelt examined eyewitness testimony from camp officials and inmates, he looked at photographic evidence of the physical remains of the camp, and he studied contemporary documents such as plans, blueprints, letters, equipment orders, architectural designs, reports and so on. Each of these three kinds of evidence, as the judge concluded, had its flaws and its problems. But all three converged along the same lines, creating an overwhelming probability that Irving was wrong. There are also reasons beyond the pragmatic and instrumental, why truth matters, why it can be seen as an inherent good. They are not conclusive, knock-down, irrefutable reasons, they are not mathematical proofs, but they are reasons. We will discuss some in the final chapter. But for now we will content ourselves with some thoughts about what human beings are, and why, being what they are, they should consider truth a very important value, and considering it such, treat it accordingly. Looked at in that light, the thought that leaps out at us is this: that humans are the only entities in the entire universe, for all we know, who have the capacity to make truth their object. The other needs and wishes, the ones that can conflict with truth, the needs and wishes for contentment, happiness, comfort, feelings of security and safety and being protected, are ones that other beings can want and strive for after a fashion But truth? No. We, by this strange provocative contingent accident of natural selection, have the kind of brain that can conceptualise reality as existing independent of us, and the possibility that we can discover what it is, along with the possibility that we can try to do that and fail, that we can think we’ve discovered it and be wrong, that we can discover part of it and be at a loss about the rest, and so on. So one intrinsic reason for thinking we ought to respect the truth, and try to find out what it is, which entails not fudging it whenever we don’t like what we find, which entails deciding firmly in advance that we will put it first and all other considerations second – one reason for all this is simply that we can, and that as far as we know we are the only ones who can. We can, so we ought to. It would be such a waste not to. If only as a sort of tribute to the remarkable accident of natural selection. To the staggering amazing chain of being – from nothing to something, to life, to intelligence, to truth-seeking. And then, truth can be seen as a major part of the human heritage. Along with the pyramids and the Great Wall and King’s College Chapel, the cumulative gathering up of true knowledge about the world is something that belongs to all human beings across time – particularly of course into the future. It doesn’t belong to any of us in particular, to any one generation, to any mere short-lived set of humans, but to all of us. No one brief generation has the right to tamper with it for the sake of its own ephemeral satisfactions. Think of the Bamiyan Buddhas. How disgusting it was and is that a band of fundamentalist thugs should dare to destroy something that ought to have belonged to all humans across time as well as across space. The truth is a Bamiyan Buddha. It belongs to everyone, not anyone. No one has a right to destroy or distort or damage it for petty temporary political reasons. 1. Richard Evans, In Defense of History , W.W. Norton and Company 1999 pp. 106-7. 2. Richard Evans, Contribution to the ‘Great Debate on History and Postmodernism’ , University of Sydney , Australia , 27 July 2002 , published as “Postmodernism and History”, Butterflies and Wheels , http://www.butterfliesandwheels.com/articleprint.php?num=5, accessed May 15, 2005. From Why Truth Matters (Continuum: 2006) by Ophelia Benson and Jeremy Stangroom, Chapter 7, ‘Institutions, Academe and Truth’, pp. 141-146. It is more than a little difficult to imagine quite what this means when it comes to subjects like accountancy and computer engineering. But it is immediately clear that BYU, and indeed other colleges and universities which are founded on religious precepts, differ significantly from their secular cousins. No doubt it is tempting to suppose that this difference necessarily undermines any claim which such institutions make that education and research are about the pursuit of truth. However, this would be to oversimplify; it is quite possible for people to carry out perfectly respectable research, in certain delimited fields, even if they believe that the moon is made of semi-skim yogurt and that a giant pumpkin is God. Religious institutions don’t throw truth out of the window altogether. Their policy is more selective; they keep the bits they like, and discard those they don’t. It follows that the exercise of individual and institutional academic freedom must be a matter of reasonable limitations. In general, at BYU a limitation is reasonable when the faculty behaviour or expression seriously and adversely affects the university mission or the Church. It’s obvious that such a policy is bound to result in problems. Scholars working in the humanities or the social sciences are very likely to be inquiring into subjects that could bring them into conflict with the specified limitations on academic freedom. This is especially the case since the limitations are vague enough so that what the BYU authorities consider to be a violation might vary over time, and from case to case, and that faculty might not be clear anyway that particular views or activities are unacceptable. It is important to make it clear here that there is no evidence that BYU staff are dissatisfied either with the university’s strongly religious nature, or with the fact that their academic freedom is necessarily limited. This is not surprising; some ninety-five per cent of faculty are members of the LDS Church, and also, as a condition of their employment, “temple worthy”, a status attained by only about one in five Mormons. The problems have arisen rather because of the perception that the specified limitations on academic freedom are applied with too much zeal; in particular, there is the suspicion that the policy on academic freedom is used in order to silence viewpoints which are unorthodox only on the strictest interpretation of Church doctrine, even though this is not justified by the letter of the policy. This point is perhaps best illustrated by the case of Gail Hurley Houston, who between 1990 and 1996 was an Assistant Professor in the Department of English at BYU. Professor Houston’s story is quite complicated. Indeed, it is the subject of a sixty-two page report by BYU administrators, which itself was the result of an investigation by the American Association of University Professors, which for its part culminated in an eighteen page report. The essence of the story, though, is that Professor Houston’s application for tenure (which went forward, as is standard, as she approached her sixth year of employment at BYU) was denied, despite its being supported by her departmental colleagues, her departmental chair, and two of the three requisite tenure committees. It was rejected at the last stage in the tenure process by the University Faculty Council on Rank and Status; the decision to deny tenure was then confirmed by an Appeal Panel hearing in August 1996.
the number and severity of occasions when your actions and words on and off campus…were perceived as harmful to the tenets held by the Church and the university. We feel that not only have these activities failed to strengthen the moral vigour of the university, they have enervated its very fibre. The BYU administration identified a number of specific occasions where they thought her behaviour had transgressed the boundaries set out in the policy on academic freedom. Perhaps most significant were two instances where she suggested that it is appropriate for Mormons to pray to the “Heavenly Mother” as well as to the “Heavenly Father”. The BYU authorities pointed out that she had previously had a warning that such conduct was a clear violation of Church doctrine, and therefore, that it was unacceptable, but that she had subsequently repeated the offence. There were also concerns that she had publicly advocated extending the priesthood to women, again in clear violation of Church doctrine. It would be easy to dismiss these worries on the grounds that they are a function of a deeply ingrained sexism which is characteristic of the Mormon religion. However, whilst this is probably true, it nevertheless isn’t clear that the BYU administrators behaved in quite the arbitrary manner that some commentators have supposed. In other words, there is at least an argument that both the following things are true: Professor Houston was the victim of religious intolerance rooted in a sexist theology; and the BYU administrators correctly applied the terms of their policy on academic freedom. There is an interesting point here, linked to some of the themes we explored in chapter 5, about how tempting it is to assess this kind of dispute in terms of viewpoints which are rooted in prior political and ideological commitments. Thus, for example, it would be easy for the authors of this book, in line with their atheism, to declare an anathema on BYU, its arguments and works; that is, to decide in advance that the justification it offered for denying tenure to a feminist scholar was necessarily going to be flawed. But if you look closely at the arguments involved in the issue, the matter is not as straightforward as that. Consider, for example, the issue of Houston ‘s prayers to a “Heavenly Mother”. The report of AAUP found that BYU had not made their case on this issue, because Professor Houston’s statements about her visions of a Mother in Heaven were a “description of a personal vision,” and did not constitute public advocacy of belief as the administration charged. The AAUP’s argument that Professor Houston did not “advocate” praying to Heavenly Mother is specious. She publicly announced that she engages in the practice of praying to Heavenly Mother and described what a wonderful experience it is. She even described what Heavenly Father and Heavenly Mother say to her in such prayers…The clear message of her public statements was that it is appropriate to pray to Heavenly Mother, that it is a wonderful experience, and that Heavenly Father and Heavenly Mother accept and respond to such prayers. However, and it is an important however, the fact that it is at least arguable that BYU acted within the terms of its own policy on academic freedom in the case of Professor Houston, albeit on the basis of the strictest interpretation of that policy, does not mean that there is no institutional pressure at BYU on faculty. The evidence is that there is institutional pressure; that a significant minority of academics fear precisely that they will fall foul of a strict interpretation of the policy on academic freedom; and, in particular, that feminist scholars tend to attract the often unwelcome attention of the BYU authorities. Many faculty members shared in some detail the narratives of their problems with academic freedom, reappointment, promotion, and tenure, frequently producing documents but asking that their names and identifying circumstances not be included in this report. At least two cases are in litigation against the university. Some cases involve issues of personal conduct that are under investigation and others focus on academic research that raises concern with the administration. Several creative artists in different fields told of pressures to alter works to meet unclear administrative agendas…Numerous women, some in groups and some alone, spoke to the investigating committee about the hostile climate for women on campus. Reading this, though, one is led to wonder quite what they expected. Religious doctrine is always contested; therefore, disputes about academic freedom are inevitable given the existence of a policy which prohibits overt doctrinal heterodoxy. But it must be said that for a professor at a religious university to complain about this situation is a little bizarre. It comes with the territory. If you’re working within the confines of a revealed truth, then there’s a lot you can’t say. Indeed, with regard to BYU’s antipathy towards certain kinds of feminism, it is not unreasonable to ask, though it certainly isn’t politic, what exactly feminist scholars think they are doing working there in the first place? After all, the LDS Church is hardly covered in glory when it comes to its record on the rights of women. 1. http://www.byu.edu/fc/pages/refmapages/acadfree.html, accessed May 21 2005 . 2. See http://campuslife.byu.edu/honorcode/, accessed May 21 2005 . 3. “Academic Freedom and Tenure: Brigham Young University ”, Academe , Sept-Oct 1997, pp. 52-71. 4. ‘The Issue of Academic Freedom: An Interview with Jim Gordon”, Brigham Young Magazine , Winter 1997. 5. Cited in “Academic Freedom and Tenure: Brigham Young University ”, Academe , Sept-Oct 1997, p. 52. 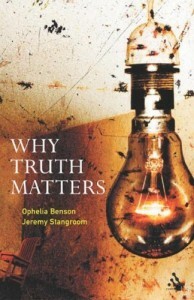 From Why Truth Matters (Continuum: 2006) by Ophelia Benson and Jeremy Stangroom, Chapter 8, ‘Why Truth Matters’, pp. 178-181. In the end, this boils down to preferences. Even the preference for a world where the lies of genocidal tyrannies are eventually corrected is still ultimately a preference. A highly reasonable, well-grounded preference, but still a preference. If we didn’t have minds, and emotions, and the moral thoughts that go with them, mass slaughters would just be something that happened, like rain. Some people do prefer to live in a thought-world where priests and mullahs claim to decide what is true. Others prefer to live in a thought-world where ideas about what is true are lenient, flexible, fuzzy around the edges; where it is possible to sort-of-believe, half-believe and half-hope, believe in an as if or storytelling or daydreaming way. Others prefer – genuinely prefer, not merely think they’re supposed to – to try to figure out what really is true, as opposed to what might be, or appears to be, or should be. This is a preference. One can adduce moral and psychological reasons for both preferences. 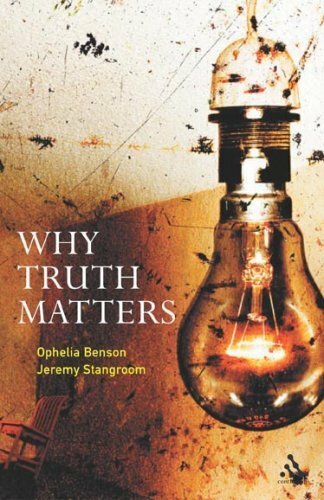 The reasons we’ve given for thinking truth matters rest on preferences, and there’s no final definitive knock-down case for them, at least not that we’ve been able to think up or find. But reasons can be good reasons without being final ones. And one last good reason for thinking that truth matters, it seems to us, is all about preferences, in the largest and most humanly important sense. It’s about happiness, flourishing, enthusiasm, about what makes life worth living, why we prefer being awake to being asleep, why it’s a privilege to be human. It’s about why truth matters . Really matters. Not in a dull perfunctory dutiful sense, but in a real, lived, felt sense – “on the pulses,” as Keats put it. This is the kind of mattering we’re talking about here – personal but also public, subjective but also communicable and sharable, immediate but also permanent, cognitive but also emotional. In a way it’s just as much about community and solidarity as Rorty’s vision is, but it’s a community that thinks truth matters rather than one that prefers solidarity to truth. Truth is perhaps the capital city on that mattering map. This reason is based on the thought that inquiry, curiosity, interest, investigation, explanation-seeking, are hugely important components of human happiness. This doesn’t seem to be a terribly popular thought right now. Public rhetoric tends to aim much lower, for some reason. It seems to see us all as hunkered down, and settling. Settling for minimal, parochial, almost biological satisfactions – family, safety, money. But that underestimates us. We want more than that. We want to ask questions, we want to learn, we want to understand. That’s a very human taste and pleasure. Again, as we said in Chapter 1, it seems a waste not to use human capacities and abilities. Anyone can settle for just survival and reproduction and comfort, but we can do more. It’s a privilege, that is – it seems a kind of sacrilege not to use it. The one thing I would try to teach the world about science is that science is not a catalogue of facts, but a search for new mysteries . Science increases the store of wonder and mystery in the world; it does not erode it. 1. Richard Dawkins, Unweaving the Rainbow , Houghton Mifflin Company 1998, p. x. 2. Spiked science survey, “If you could teach the world just one thing”, http://www.spiked-online.com/articles/0000000CAA95.htm, accessed May 21 2005.